Harvest season is here. Two weeks ago, while I was in Champagne, vineyard workers were busy picking grapes, and winemakers had their hands full crushing the fruit. 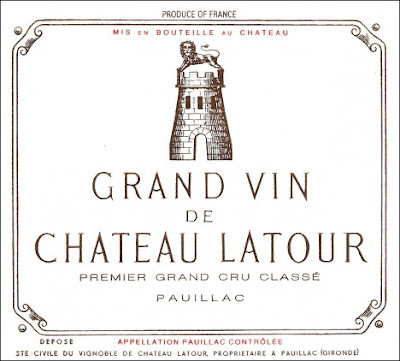 Now, Decanter.com reports, it’s Château Latour’s turn down in Bordeaux. One of the grandest of the First Growths, Latour began harvesting Merlot a couple of weeks ago, with an eye toward picking its Cabernet Sauvignon sometime around October 5th. Below is a video that was posted on Decanter’s web site; that’s Penelope Godefroy speaking, Latour’s Quality and Research & Development Manager. Scenes like this are unfolding all over Bordeaux right now. Let’s just hope the weather holds. On another Bordeaux note, Château Brane-Cantenac, which readers here know I’m very fond of, has a new label. Fans of the great Second Growth will notice that, starting with the 2007 vintage, the label is just a bit cleaner, with some of the information that had previously been on the front label now relegated to the back one. But it’s still the same general idea, with crisp black lettering set against the famous brushed-gold background. And the capsule, once red, is now black. Below is a photo of the new label. For my tasting notes on other vintages of Château Brane-Cantenac, click here.